Wrexham is one of the the latest additions to the ever-growing Eurocell branch network. Though it began trading at the end of 2015, it opens officially on Tuesday February 16 and brings the total number of branches to 142. “We have been looking for suitable premises in Wrexham for some time before we selected this unit, which is close to the town centre’s amenities and to other merchants,” said Paul Dixson, Eurocell Regional Manager (North West). “The new branch in Wrexham opens up the North Wales area and complements our existing branches in Bangor and Chester. We hope to announce further branch openings in this area in the near future,” he added. Located on Rivulet Road, Cambrian Price Industrial Estate, the branch is easily accessible from the A525 and the town and provides ample parking with plenty of space for loading and turning. The branch will serve its own clients but can arrange delivery through the comprehensive branch network to where ever its customers might be working. The two-man team staffing Wrexham consists of Branch Manager Mike Mainwaring, who has transferred from the Chester branch, and Area Manager Arwell Edwards, who has extensive experience in the industry. 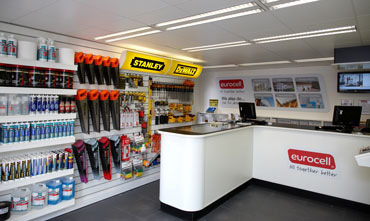 In common with all Eurocell branches the new branch features a showroom with a large trade counter area and stocks products including doors and conservatories, roofline, rainwater systems, window finishing trims, as well as lines such as underground drainage, hand tools, power tools and protective clothing. All are available to take away, buy online or for direct delivery to site.